Silk-épil 9 wet and dry epilator for women bonus edition with facial cleansing brush - fastest and most precise epilation plus cleanses face up to 6x better than manual. 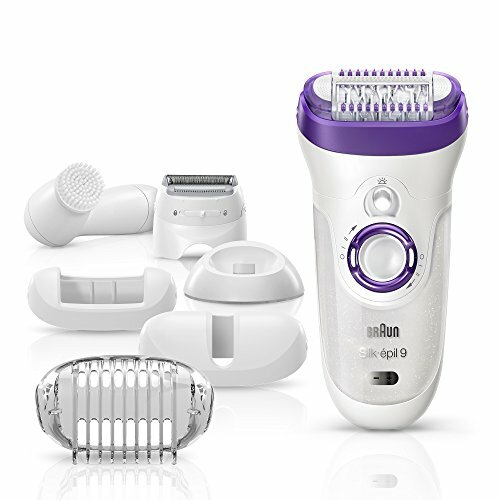 Braun introduces Silk-épil 9, the new standard of epilation excellence with a wide epilation head, for faster hair removal results, and breakthrough MicroGrip tweezer technology. A shaver head and trimmer cap are included to convert your epilator for women into a full-fledged electric shaver for depilation. Braun's most innovative MicroGrip tweezer technology with wider, longer and deeper tweezers removes, with precision, hair 4X shorter than wax does. Wet and Dry usage in the bath or shower for a more comfortable epilation. Virtually painless with regular use. BONUS Braun facial brush removes makeup and pore-deep impurities - 6X better than manual cleansing - in addition to refining and exfoliating skin with micro-oscillations. 100% waterproof for comfortable use in the shower.